One time Mom asked me who I would want for a mother if I didn’t have her. Right off I said my best friend Connie’s mother, then I stopped and thought about it a minute. Nope, I only wanted Connie’s mom so I could live with Connie. Connie’s mom was terrible about putting pony tails in Connie’s hair; Mom could put my hair back in a pony tail neat enough to stay all day long. Connie’s hair was always coming loose and sticking out all wild-looking. Not Annette’s mom that’s for sure. She was good at sewing and cooked food from the old country, like nobody’s business, but she was super strict, and probably would make me stop wearing shorts in the summertime; Annette never got to wear shorts. Betty’s mom knew a whole lot about other people, but if I lived with Betty, I’d get a big sister and a big brother; one big sister was enough for me to keep up with. I told Mom I guessed I better stick with her. “Hmmm,” was all Mom had to say to that and she got a look on her face like she did when she was studying a new dress pattern and wanted to make sure she got it right, ’cause she hated to tear stitches out. Sunday was Mother’s Day, and me and Bonita had our eyes on the lilacs. Not full bloom yet, but about half-way. Close enough. I got dressed fast and hurried up Bonita and Vickie, so we could get outside before Mom noticed. “Where’re you going?” Deanna hissed at me, as she was brushing her teeth. “To get some lilacs for Mother’s Day.” I said. “Mom said not to pick those flowers unless they were fully bloomed.” Deanna shifted her weight to one side and put her hand on her hip. She spit out her baking soda and salt solution like she was mad at the sink. We didn’t use toothpaste ever since Dad said no matter what he did, us kids wouldn’t squeeze from the bottom, and toothpaste was too expensive to waste, and besides that, baking soda and salt are the best for teeth, which was probably true, ’cause my teeth really sparkled. Anyway, Deanna sure did look like Mom standing there, looking down at me, like I already should know better. That just made me more determined to get those lilacs. 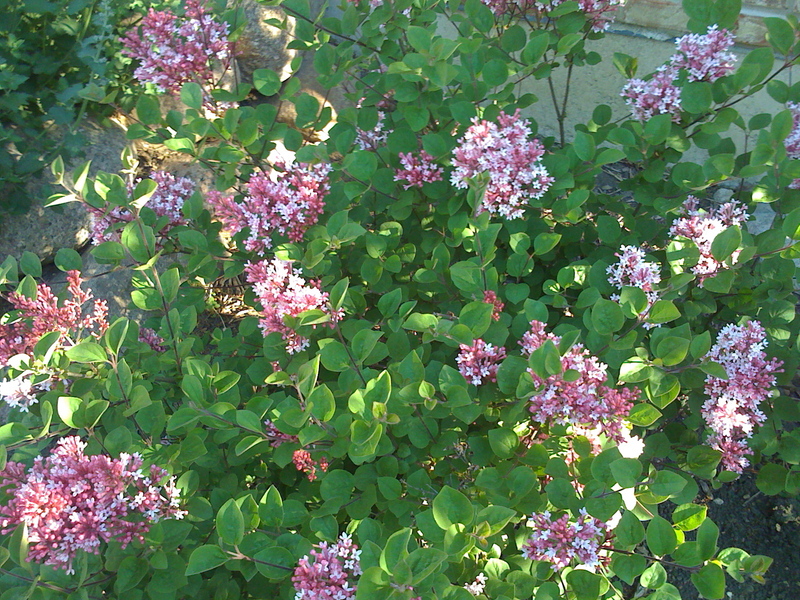 I could smell lilac all around me as soon as I stepped out on the back porch. The sunshine made the grass all dazzly and the dandelions looked just like baby suns, all shining and happy looking, so I sent Vickie to pick a bunch, while Bonita and I tackled the lilacs, and grabbed some mustard flowers from behind the Brooder House. We had to work together to get the lilacs, ’cause the flowers were way up high; so I pulled the branches down, and Bonita ripped the flowers off. That was pretty tough, but we managed to get a giant armful. Mom was gonna love these. Some of the branches stayed down, but the lilac bush had a lot of branches still sticking straight up, so I was pretty sure Mom would never notice. Then we all went to the side of our house to top our bouquet off with some white quince. Now that was super-fun, ’cause we called those bushes ‘snow bushes’. The flowers were just right for shaking. I got Vickie to sit underneath and Bonita and I just shook and shook, and made those flower petals snow down all around Vickie, sticking in her blond hair and all over her dress. She looked up at us with her blue eyes dancing, reaching her hands up and laughing up at us. That was keen as keen can be. We almost forgot we were getting a bouquet for Mother’s Day. “Bonita and Adela, where are you?” Mom called from the back porch. Almost always when she called like that, it meant me and Bonita were close to trouble or already there, so we high-tailed it to the house. For sure, Vickie was safe, she was too little and innocent to be in any trouble. “Look at you,” Mom said. That’s when I saw those sick yellow-green dandelion streaks all over Vickie’s dress, making it look like she puked all over herself, plus her socks were all wet and muddy looking sticking out of her pretty Sunday sandals, with old flower petals stuck all over them and in her dress too. Mom clicked her tongue in the back of her mouth, and she smiled at us, but it looked kind of like she pasted that smile on her face, ’cause her eyes looked droopy like mine felt just before I cried after somebody hurts my feelings, and she moved around fast and jerky, like she did when she was a little bit mad about being late. Plus, Loren lost his shoes again, and Deanna was scurrying around looking for them. As soon as Bonita and I heard that, we started pulling toys out of the toy box, ’cause for some reason, Loren was always putting his shoes in there, and no one sat still when Mom was looking for something and it was time to go to church, ’cause any minute she might have one of her screaming banshee fits, and nobody wanted that, especially on Mother’s Day. When it was time for Father Wishmaier to tell us what the Bible story meant, he changed up his mind, and just told us about how we should be good to our mothers instead. Everybody in the world knew that, nobody needs to say it. But that day, he said something that stuck with me. Father said we should be good to our mothers, because if we don’t, we’ll have two kids just like us when we grow up. After church, I asked Mom if she was bad when she was a kid and if she thought I was her punishment, and if I was, did that mean I would still have two kids like me, or if I was off the hook. She just rolled her eyes over to Dad and said, “I’d like to figure out how your mind comes up with the things you do,” and she pretended to be disgusted with me, but I could see by the way her eyes danced that she was feeling more like when I came home with my report cards and had all A’s. “The loveliest centerpiece a Mother’s Day table ever had.” Mom said, and this time I could tell her smile was for real. In the years since I’ve seen some Mother’s Days almost exactly like that one when I was a little girl. The one that sticks in my memory the clearest is when my oldest plucked all my tulips and held them out to me with gleeful anticipation with dirt and bulbs still hanging from the limp stems. If I could choose anyone in the world to be my Mom, I would still choose her. If I was her punishment, I’m sure by now, she’s more than earned her way into heaven with her love, her restraint and her wisdom. She’s the best Mom a little girl, or a big girl could ever want. Oh, to live those days again! At the time it seems as though the muddy socks, dirty dresses and the hectic time it took to get everyone ready again for church stood out the most in a mother’s mind. It was difficult to truly appreciate the “beautiful” centerpiece and all the love that went into it. But all but the LOVE is forgotten when we take time “to smell the roses” On second thought, I wouldn’t want to live those days again since you reminded me of the muddy socks and dirty dresses and being late for church. I probably still would have a banshee fit, I’d rather just look back and remember the love. I’m with you all the way. It takes being a Mom to understand a Mom. What a beautiful story. Your mom was also very talented in picking out names. I love Adela and Bonita. Very pretty! 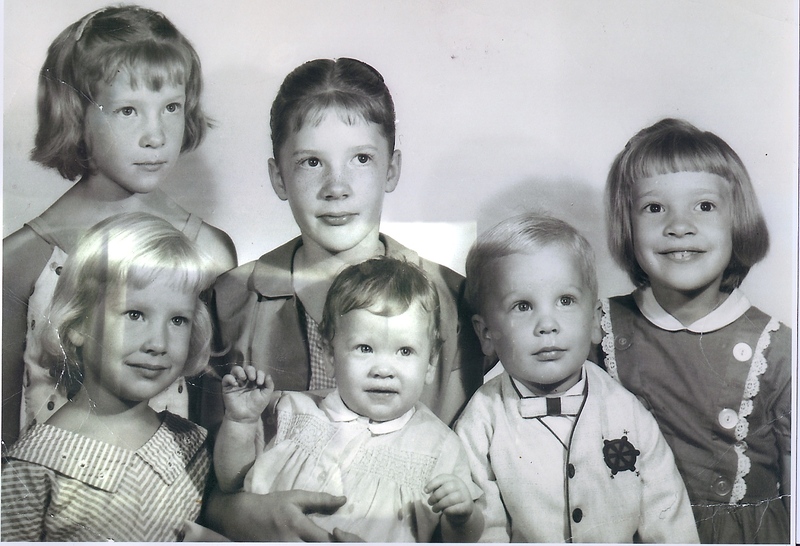 My dad picked the girls’ names: Deanna, Adela, Bonita, Vickie, Julia, and Marcia. Lots of Spanish names in there for a Heinz57 pedigree. I joked that he must have been in Spain during the War!